A North East technology company has opened the doors of its new offices in Gateshead and announced plans for further expansion and a recruitment drive. Converged Communications, a BT Local Business, is part of a national network of independent businesses backed by BT and EE, which brings technology products, services, expertise and local understanding to the doorstep of the region’s small and medium sized businesses. The company, which employs 25 people, has recently recruited two new members of staff and is looking to fill a further 10 desk and field sales positions over the next three months. Owners, Matt Holmes, 44 and Steve McQueen, 44, set up the business in 2007. Originally the company covered just Newcastle but then proved to be so successful that in 2013 it expanded to cover the whole of the North East. It now serves around 80,000 customers in the region. Matt said: “Ten years ago Steve and I spotted the potential of the North East as business and tech powerhouse so we both made the big decision to move from the North West and build this business. Living and working here has been invaluable and we can’t imagine being anywhere else now. To celebrate its move to new headquarters at Northumbria House, Delta Bank Road, Gateshead, the company hosted a launch event where dozens of local businesses were treated to a presentation focusing on what innovative technology is available today, as well as what the future of communications could look like. Earlier in the day, school children from Holystone Primary School visited and took part in fun computing and coding sessions designed to teach them the importance of technology and communication in everyday life. Matt added: “The launch event was an opportunity for us to celebrate how far we’ve come over the past ten years but it was also an opportunity for us to show North East schools, colleges, universities and businesses, how they can benefit from having our facility on their doorstep. And how we can help them make better use of the latest technology. “First class communications are vital for the future of all organisations whatever industry or sector in which they operate. 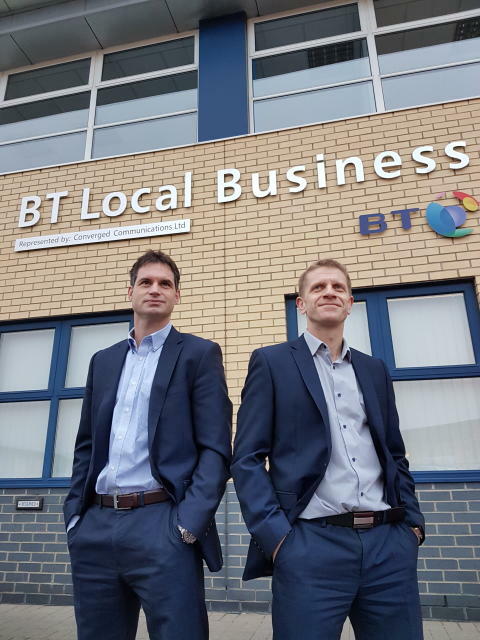 Simon Roberson, BT’s regional partnership director for the North East, said: “It was great to attend the launch event and celebrate the success Matt and Steve have worked hard to achieve since starting out. Entrepreneur and communications expert Mike Jones, who launched the first ever BT Local Business in Norfolk and Suffolk, was a guest speaker at the event alongside Carl Haagensen from Entrepreneurial Spark. For more information about Converged Communications please visit https://business.bt.com/bt-local-business/newcastle/ .